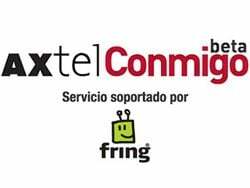 AXTEL, a Mexican telecommunications company, today launches its voice over internet service "AXTEL Conmigo" in partnership with fring. With fring, AXTEL Conmigo becomes the first Mexican telecommunication service enabling subscribers to receive fixed telephone line calls to mobile devices. AXTEL customers with fring will receive their home phone calls as well as personal computer correspondence with social networks (such as Skype, facebook, GoogleTalk, Twitter and others) directly from their mobile devices. fring also enables subscribers to share internet experiences including live chat, video calls, file transfer and more from mobile devices for free over Wi-Fi or 3G data packages. Tomas Milmo Santos, AXTEL’s Chairman and CEO stated, "fring is a natural extension for AXTEL’s offering… Partnering with fring helps us realize our vision to enable AXTEL subscribers to seamlessly stay in touch with their friends wherever they are at home and on the go, in Mexico or around the world." fring on AXTEL is supported on variety of smartphones including iPhone, iPod touch, Windows Mobile, Symbian and Android devices.